From the log book of Gerry Woodburn, the first Scout Master in Stapenhill. It was decided during 1955 to attempt to form a Group at Stapenhill, as it was felt there was a great demand. The vicar of St Peter’s Church was contacted but turned down the idea and so the Education Authority was asked for assistance. 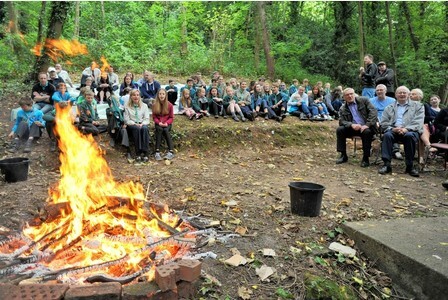 They agreed to allow the group to use Hill Street School two evenings each week, free of charge. 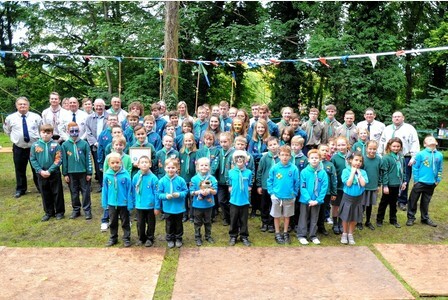 Cub Section formed with 12 boys with Miss R Oliver as Akela and Martin Potter as Cub Instructor. It was proposed to form the Scout Section on this date and a display was laid on by the 14th Burton but alas! Only the Scout Master and Group Scout Master of the proposed troop were there to witness it. Not one Stapenhill Boy turned up. After the failure to attract any boys, consultations were held and word got to the Burton Daily Mail, that evening two paragraphs appeared relating the story. The result of this publicity was amazing as 28 boys were at Hill Street School to greet the Group Scout Master, Mr G.Curran, and Scout Master Mr. G.A. Woodburn. 22 boys were enrolled as 6 of the 28 were only of Cub age, and they were told to go to the pack meetings on Mondays. 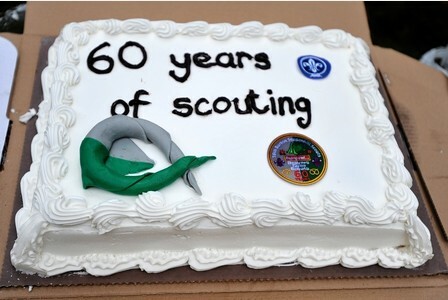 Today, the group still offers a wide range of traditional Scouting activities and is thriving and growing. The group is also forward looking and is currently planning the construction of a new building, which will enable them to offer a better experience for their members, the community and visiting Scouts. 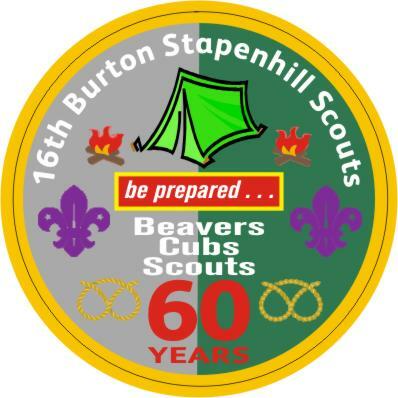 September 20th 2015, the group held a celebratory open afternoon, open to current members, past members, and anyone who wanted to come and see what Scouting in Stapenhill is all about. 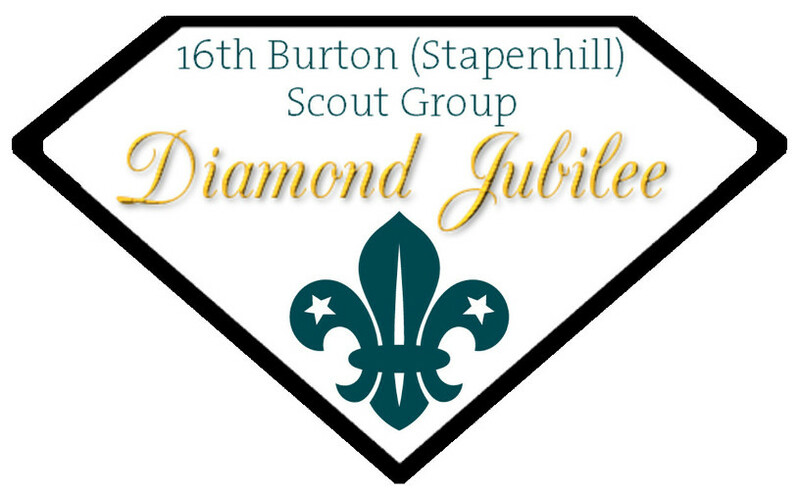 We held a competition within the group for the Beavers, Cubs and Scouts to design the anniversary badge and this was won by Dylan Jackson. 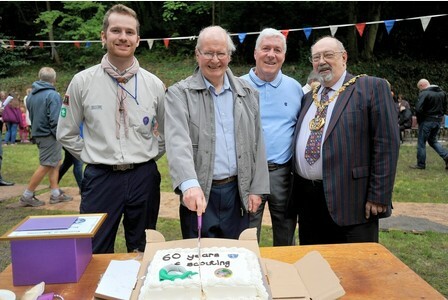 Gerry Woodburn (first Scout Master of the 16th) cuts the cake, accompanied by Jonny our then GSL, one of Gerry's first Scouts, and former Scout and then Mayor, David Leese. A great day was had by all, it was a pleasure to see so many of our current members there in uniform and also to see so many former members of the group. The day was finished off with a traditional Scouting campfire with appropriate songs.